We use GIS technology to implement safe efficient and sustainable solutions for multiple land-use scenarios. NSA team is more than prepared to take any challenge. When a project involves the surveying of hundreds of miles of pipelines, land use mapping identification, assistance with capable computers, or precisely overlay aerial and photographic data onto engineering and development planning. Above all, we integrate our refined data communications network, high-quality tools, and professional staff. NSA land survey services can be an efficient solution for every project. 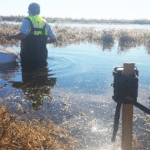 We exists to bring solutions when a professional land surveyor is needed.